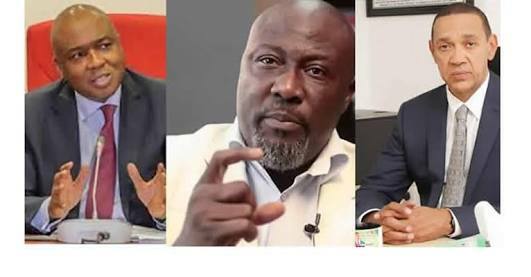 President Bukola Saraki, Senators Ben Bruce and Dino Melaye should submit themselves to the police for investigation for alleged breach of the public peace, a Federal High Court in Abuja has ruled. Justice Okon Abang, in a judgment, declined a prayer by the three senators for an order nullifying the October 6 and 8, 2018 letters of invitation sent to them by the police. 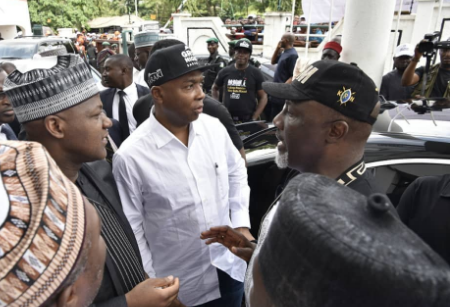 The police invited them in relation to the protest on October 5 in Abuja by the PDP, shortly after the APC rigged the Osun State governorship re-run, which the Tribunal has declared as illegal. Justice Abang said the police, by virtue of the provision of Section 4 of the Police Act, was empowered to invite anyone while carrying out its statutory functions of detecting and investigating crimes. The judgment was in a fundamental rights enforcement suit filed on October 8, 2018 by the Senators, in which they claimed the invitation letters from the police breached their rights. The judge said the invitations sent to them by the police did not amount to harassment and intimidation, as claimed by them. Justice Abang was also of the view that the police, having alleged, in its response to the suit, that the PDP’s protest was dispersed following the protesters’ riotous and criminal conduct, it was within its (police’s) powers to invite suspects for questioning. The judge added that the police invitation extended to the applicants remained valid, subsisting and must be honoured “without fail”. Justice Abang said the senators could however complain of rights violation depending on the outcome of their honouring of the police invitation.